From playing percussion instruments with locals in his rallies to his donning traditional headgear, Prime Minister Narendra Modi has made himself a reputation for making eye-catching appearances. But Congress chief Rahul Gandhi too has followed suit in recent months, especially upping photo-ops and social media posts. Today, after a rally in Ranchi, the Congress President joined a group of locals in performing a folk dance. 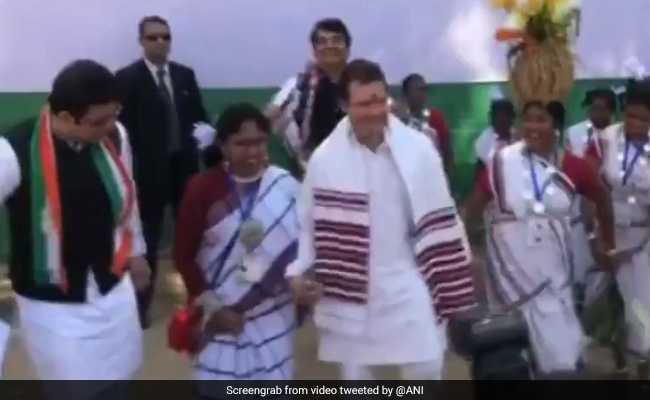 Clad in a white kurta with an “Uttariya“, which is a traditional shawl, around his neck, Rahul Gandhi performed a folk dance with some locals after his rally in the Jharkhand capital. The locals, along with the Congress chief, moved around in a circle, holding hands, to the beat of a drum.Earlier, addressing the crowd, Rahul Gandhi had said that if his party is voted to power, it will give minimum guarantee income and that the money will be transferred directly to the accounts of the poor. He also attacked the Prime Minister over the Rafale deal and waiving of loans of industrialists but not those of farmers, students and shopkeepers.